About And To Order This Book. Revised & Expanded. Includes Historical Photos! Written so a beginner can understand and work with the technology--yet comprehensive enough for the experienced professional--this 448-page, 8-1/2 x 11, user-friendly manual is packed with information. 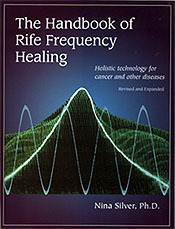 Contents include: the differences between holistic and allopathic medicine; a history of Rife's life and inventions; hard-to-find information about holistic therapies for supporting and detoxifying the system; FAQs about about Rife sessions and machines (including how to give yourself a session, who can and should not use the technology, and how to find a unit that's right for you); new developments in the field of biological and DNA research; and 200 pages of frequencies, with annotated entries fully explain the medical terms, describe the symptom pictures, and include complementary therapies to be used along with the Rife sessions. Highly acclaimed in Europe as well as in the United States, this valuable reference book is one that you cannot afford to be without. Reading Information About Royal Raymond Rife, Then Please CLICK HERE. Reading Information About My WAVESHAPER™ Frequency Instrument &/or ELECTRO-CELLULAR ENERGIZER I™, Then Please CLICK HERE and HERE.